As might be expected this is a goofier, less angsty, more stylised version of Cyborg. 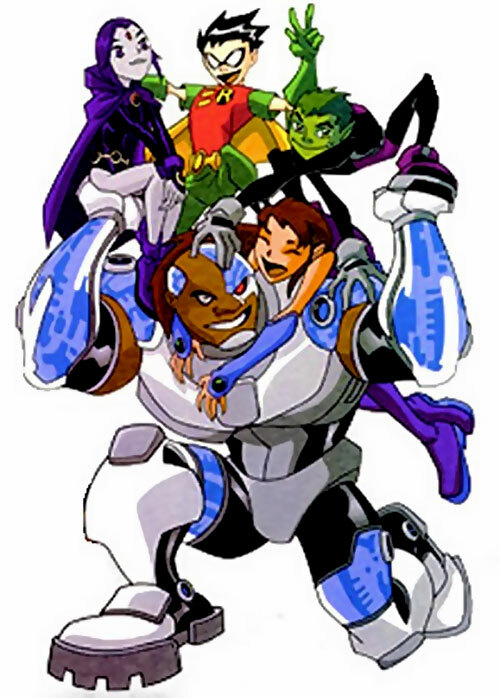 Group Affiliation: Teen Titans (former) H.I.V.E. Academy, Titans East. Base Of Operations: Titans Tower. Height: 6’ Weight: 300 lb. Age: Late teens. Eyes: Brown/red. Hair: Bald, possibly shaved. Cyborg is a hulking mass of man, metal and intricate circuitry. But he does not dwell on that at all – he’s more concerned with what’s in front of him. A sonic cannon, which he can project from his right arm at will. A smaller sonic blaster located in his left foot. Two sets of missile launchers (one in each shoulder). High-end sensor and communication technology. He can also produce several different tools (a saw, a welding torch, a buffer, etc.) from his arms. When Cyborg fought his darker self, he produced a second sonic cannon in his left arm. At one point, he installed a super-processor chip called the Maximum-7 to further increase his abilities, but an overload forced Robin to remove it. It is hard for fans to tell which parts of his body are organic human parts. Many think his torso and head are authentic, yet it is often hard to tell. In the episode “Crash”, Beast Boy and Gizmo enter his body in microscopic form, and only synthetic parts are seen. Cyborg’s greatest weakness in the series is his dependency on power sources to maintain not only his strength, but his very life. 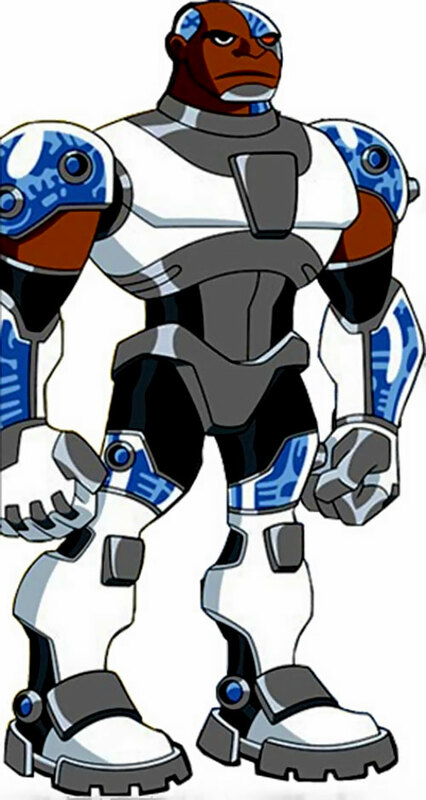 It was revealed in a later episode, “The End Part 1”, that Cyborg can interface with Titans Tower and its security system. He draws energy from it and uses it to power two super powered Sonic Cannons that project from both arms. The power from these cannons appears to be much greater than his normal blasts. He uses these cannons to attack the then-immortal Slade and Trigon’s immortal army, but because of the immortality of his targets, the attack fails. A devastating accident forced Cyborg to be rebuilt as a human/robot hybrid. Details are not available, as the tragedy of his origin was downplayed in the series, but were brought out as subplots to several episodes. 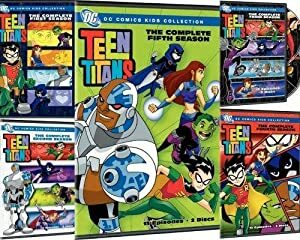 It is clear though that Cyborg’s present is what is important to the character, not his past, and his present is as a member of the Teen Titans, and being with his friends. While he’s a powerful presence in showdowns with villains, Cyborg takes a lower profile back at Titans Tower. He loves hanging out with the other Titans, but he clearly spends a lot of time in the gym, too. Cyborg has a competitive relationship with his fellow Titan, Robin – which sometimes leads to clashes in leadership. Cyborg sometimes has difficulty reconciling himself to his half-machine nature. He often feels he has lost something of himself in the conversion to cybernetic powerhouse. 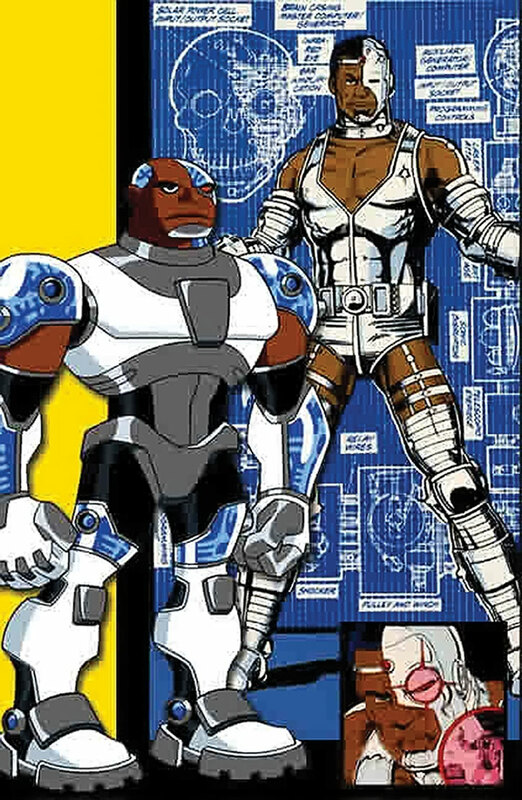 Cyborg’s mettle was put to the test when he encountered Brother Blood, the evil leader of the Hive Academy. Cyborg was able to resist Brother Blood’s mind-controlling abilities when no other member of either Titans team could. Cyborg proved himself an able leader when he guided Titans East through their stormy first days, molding a team out of a group of rampant individualists, and handing Brother Blood a devastating defeat. The few remaining survivors of the Technis race reconstructed their planet in another part of the galaxy. Although they had survived, the inherent problem which had caused them to assimilate Victor Stone in the first place (the lack of a human soul) remained. They decided to create the next best thing, and using a small amount of Stone’s genetic material made a technorganic clone, which they rapidly aged to maturity. The finished result was not what they were expecting, however, as the the laid-back, fun-loving clone was completely unlike its original in personality. The clone soon began to express a deep loneliness, which was augmented when it began having highly stylized dreams of Cyborg’s adventures with the original Titans. Although at first tempted to scrap this failed experiment, the Technis found in themselves a peculiar aversion to doing so. The thought of wiping out this creature they had created filled them with inexplicable negative emotions. In conceiving and raising a child (albeit in a very unconventional way), the Technis realized that they had learned more about humanity that they had ever expected. In this narrative it had been ripped apart by an accident that killed his parents and had forced him to undergo a cyberization process which also affected his memory (thus accounting for the gaps which the Technis could not fill). They also placed, as the most recent memory, the technoclone running low on energy and thus passing out. The Technis sent a small fleet to Earth, which managed to slip by the JLA’s observation long enough to place the clone outside a large metropolitan hospital. Leaving the planet, they were confronted by the JLa and initiated a battle in which they were destroyed, all so that they could cover up what their true agenda had been. Awakening in the hospital, the clone chalked up his inability to remember the last several months to having run out of power and thus suffering another memory glitch. Remaining in Jump City, he has put his talents to use as an engineer, as well as pursuing a public superheroic career. He uses the name “Cyborg”, because it just feels right, but has yet to meet his forebear. Iron Will is Innate (i.e., not a result of his Cyborg body), and is probably a Skilled Power. Anatomical Division: Though Cyborg seems to be able to remove any of his limbs, His legs are essentially immobile when removed, and hence aren’t covered by the Anatomical Division Power, except in that his Dex is lowered by 2 when a leg is removed. The other basic functions of AD are Hands/Arms Only. Remote Sensing: via Hand Cameras Only. Area Knowledge: City [Jump City], Headquarters: Expansive [Titans Tower], Leadership, Lightning Reflexes, Scholar [His Own Systems], Stabilization, Hardened Defences. Arch Enemy [Brother Blood], SIA (Food), MIA (Competitiveness), MIA (Video Games), MIA (Technology). T-CAR [BODY 06, Running: 07, Flash (Headlights): 03, Friction Control (Oil Slick): 06, Fog (Smokescreen): 06, Sonic Beam (Area Effect, Sound System): 03 R#2. Misc: Cyborg can use his Telepathy (Computers Only) to remote-control the T-Car using his own Vehicles Skill)]. Recharge Unit: [BODY 06]. The recharge unit doesn’t really *do* anything that can be defined game-mechanicswise, but it can be used by a crafty GM as a plot device. Cyborg uses it every night to recharge his systems, presumably if he does not do so it will affect his performance (tho that hasn’t been demonstrated, it would be a Power Complication subplot), and on one occasion it was a vehicle for a computer virus to infiltrate his systems (Beast Boy tried to play a pirated video game on it). Cyborg possesses both a human brain and integrated computer circuitry that makes him vulnerable both to attacks that affect the mind and those specifically effective against computers. Cyborg is NOT immune to disease, poison (Poison Touch), and attacks that induce sleep. (In the case of Poison Touch, his human parts can be targeted fairly easily with a Trick Shot). Cyborg does need food (and apparently LOTS of it) and sleep (as his mechanical parts need a recharge), and does age conventionally (As seen when Starfire was accidentally thrown into the future). He also needs to breathe. 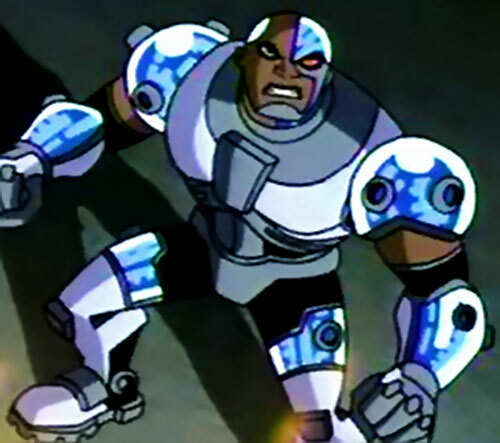 Cyborg differs from his comics versions in a number of significant ways, some of which relate to the genre in which he operates, others of which relate to his preferred methods of fighting and tactics. Firstly, Cyborg has a higher HP total than his comic version. This is directly related to the number of HP he spends in the series. Cyborg is often using HP to enhance his blows and to LDD damage. Secondly, Cyborg uses a lot more Devastates and Criticals against opponents who can take the damage he dishes out. He often uses HP to offset the negative CS to the OV of such an attempt. Third, Most of Cyborg’s attacks score Knockback. The genre itself apparently makes scoring Knockback much easier than standard genres. In the Teen Titans Animated genre, all attacks are considered to be Planned Knockback for the purpose of determining when and how much Knockback is scored. As a side note, in this genre Acrobatics can be used to resist Knockback. Helper(s): Tom Eilers, Eric Langendorff, Civafan2 (wrote the DCU History), titanstower.com , Kal El el Vigilante.